I see the master has done it again. I am really looking forward to this during my flight to Canada for Christmas. Cheers Hal! The only thing that would make this scene work is changing Jabba with Bib Fortuna with a few adjustements to the dialogues. Great idea with Fortuna. That would build up the suspense behind Jabba being some big crime boss that much more. …has anyone considered changing this scene to leave it in a fan edit by overlaying terrible CGI Jabba with a Hologram image of Jabba and then changing Harrison Ford to match the deleted scene where he doesn’t step on the tail? Not sure of how painstaking that would be but guessing a lot. It seems completely plausible that Jabba might send his minions to talk to Han and drop a Holo projector on the ground so that Jabba can show his seriousness of taking time to talk to Han but not so much that he actually has the time to be present (Han and Jabba aren’t peers and why is he able to slither around if Huts have such long lives and young CGI Jabba appears just a few human years before fat Don Corleone Jabba?). Maybe Greedo just jumped the gun and instead of being a good little soldier decided to take matters into his own hands and then get’s snuffed out WHEN HAN SHOOTS FIRST. I doubt it to. I know that some editors have gone back and revisited their work with newer versions, but I don’t think this editor ever did. I shared your versions of the prequals with a Star Wars podcast host friend of mine Hal. He’s interviewed The Phantom Editor and NVJC and some others before and he is always talking about the Phantom Edits. He likes the edits I gave him but I think we are still at odds as to which we like better. I am partial to your edits and he still remains loyal to the Phantom. It’s like a football fan argument. lol I do have to admit that I like the Phantom Editor’s DVD commentaries. But your edits are still my canon! Hello! I began with a search through the forum, but this edit was of course down so long ago that I didn’t come across another thread about it. I dislike adding new threads when I can revive an old one for a simple question. Was there ever an HD version of The Phantom Edit and Attack of the Phantom re-released? 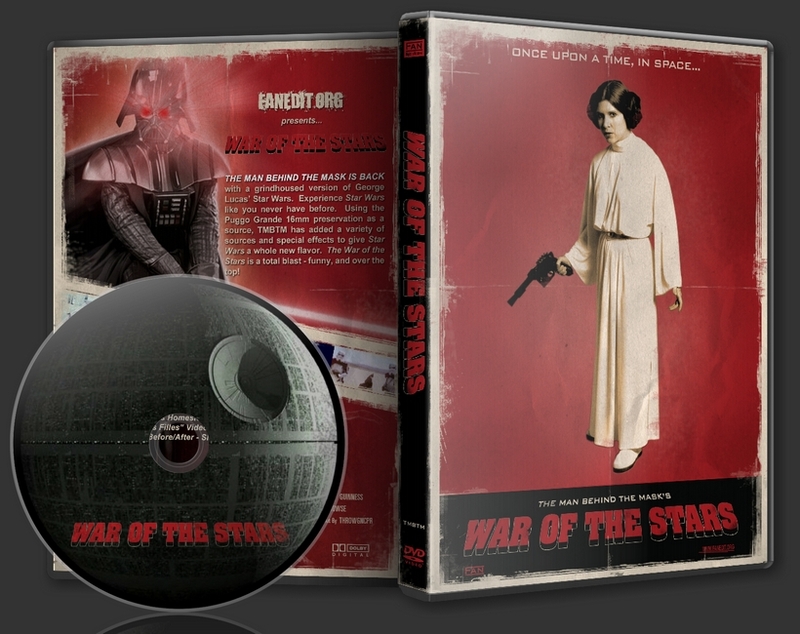 The old DVD5 physical versions I have have degraded audio (these were the first fan edits of Star Wars I obtained) particularly on the commentary. I still have the Video TS folders so I can attempt to create some new mvk or DVD disks but I heard a rumor that there might be better versions out there? The rumor came from some other fans but for most of them they call all edits of the prequals the Phantom Edit. Just curious if anyone has ever heard of HD versions being re-released. These are amazing! I might just have to re-cover my entire collection! They’re on YouTube last I checked. Awesome! Thanks mate. I did not even think to look there /facepalm. I can download them and then encode them into the films. Thanks a lot. I am just on a search for something that I have not been able to find for my collection. I have a lot, read most, of the amazing Star Wars fan edits mentioned here and in other locations, but the ones which have eluded me are The Phantom Edits WITH commentary. I heard about the commentary tracks and for a fan of people with a set of skills I admire, these I would love to listen too. I just haven’t found them. Anyone know if they are still available? Cheers! Incredible. This is an impressive list Hal, and a lot of elbow-grease type changes. Updated the preceding post and the OP to remove the idea of hybridizing the original and SE versions of the establishing shot/sequence of Han and Leia in their apartment on Cloud City. If I were trying to “thread the needle” with a perfect version, I’d like to do it that way. But, for a tweaked SE intended as a companion to a properly restored OOT, the SE sequence is just fine. I also decided that it is worth making an additional exception to the rule by depicting the Falcon as being in hyperspace after the escape from the Death Star in ANH, as Adywan did. At first I thought, “It’s not like ANH had no concept of a hyperspace blue tunnel thing which reflects into the cockpit, because we see it when Han comes out of hyperspace over Alderaan’s location. They just, for whatever reason, chose not to depict this scene in that way.” But, then I remembered that Vader describes the company as just having made the jump into hyperspace immediately prior to the scene, and no passage of time can be inferred. While I would prefer to stick close to the official versions, this and Adywan’s emperor scene would be worthwhile, wholesome exceptions. This is one of those things which I have always thought about every time I watch ANH. I’ve watched this film so many times that I am numb to the affect it has on my experience, but I still think about it. Glad to see I am not the only one! Pardon me if I missed this discussion (I haven’t had time to read the entire thread yet) but for the cargo shuttle replacement is Ady using the Zeta-class cargo shuttle from Rogue One or the Sentinel-class shuttle from A New Hope Special edition? Just curious. Overly curious. But I can wait. Ady, I am sure you get overwhelming amounts of offers like this, but if your team hasn’t shot in California and you need any help, of any sort, please let me know. I offer my services and time and whatever I can to this project! To be fair, in both Canon and in Legends there is an entire half-ish side of the galaxy which is not mapped and known as wild space. It’s a weird thing which needs better explanation in the overall lore of Star Wars, and I am not even sure how the mapguffin actually fits in with the current Star Wars map we know. Some Internet research is in order. I would be really interested in seeing the results of this. Ahsoka has such a great character arc. OMG I thought I was the only weirdo that had that thought in the theater when I was watching The Last Jedi. Astonishing. The Force Awakens Restructured is my go to movie I watch the most now, when I want to just have fun with a Star Wars film. The edit is just… it’s so good. It’s such a fun movie when you aren’t forced to over-analyze it because the plot seems out of sync. I like it! Great instructions! I don’t use glue, but rather masking tape to hold the parts together. I have had a hell of a time getting cover art correct. I have been looking for the higher quality version of this cover forever now, and I have had no luck! Yes, that is the very same way I have made mine. I believe the article I read is the same that video came from! It’s just the final art work / labels which have become the biggest issue. Using just glossy white label paper works for now (the site I purchased from didn’t have gloss black) but it’s not my end goal. I thought I would post here and maybe catch the correct person’s attention. I am attempting to create some box set covers and the process is pretty straight forward, only I am having some difficulty creating the artwork for the box sets. I was printing on label paper and cutting to size but I have been having some trouble getting the sizes right, pixel to inch conversions and all that. Has anyone else attempted this and had success? These turned out so well that I made some box set cases for them. Thanks solkap! Shouldn’t you leave a spot for Episode 9?! I re-watch TFA restructured so often, that I am getting really excited for the finished product for this film. I left a spot for it in the box set I am making. Hal, your edits are simply the best. No, for reasons stated earlier in the thread. The Caretaker raiding scene has uncompleted effects, as many of the deleted scenes unfortunately do. Have you noticed hal, as an editor, in more recent movies are deleted scenes added to the Bluray in their unfinished versions rather than becoming fodder for editors, or is this more of the direction of each studio and director and only some movies have somewhat polished deleted material? I just seem to recall many more DVD releases of the past having more finished clips. I was wondering if studios and directors have become more protective of their material since technology has progressed to the point it has, or if it is more the timing of the clips being cut like in early editing rather than near post production editing. Here’s my paint-by-numbers implementation of poppasketti’s mockup for Snoke’s death. Wow. I hope that some personal bias is not weighing in, but this just seems theatrically better? Less is more?